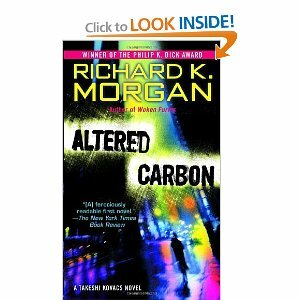 I read a great book, Altered Carbon by Richard Morgan. I forget how I came across this book, it may have been a review somewhere or I found it at Half Price Books, however it came into my hands I’m sure glad it did. It may not be for everyone, but if you have my taste you will enjoy it. It’s kind of an unusual combination of science fiction and detective story. The detective part is done really well and I like the pacing. The mystery unwraps deeper and deeper and more characters motives are being revealed all along. The science fiction part is used well, sometimes SF stories are just a regular story “but we’re in the future so it’s cool!” The main technical advancement in this future is that human consciousness can be digitized and moved to a new body or run in virtual on computers and Morgan does a good job exploring all the ways that would be exploited – restoring people from backups, two copies walking around at once, being downloaded into a body of the opposite gender and more. They are all necessary to the plot and well thought out. You like detective stories, or if you’ve never read a detective story so you don’t know if you like it or not. I fell into the latter category and while I don’t know how it stands up against whodunits in general I liked it. You don’t like SF. If you are the type who doesn’t want to have to figure out technical ideas in order to understand the plot. I highly recommend it. It’s the first in a trilogy but stands alone nicely. There are no lead ins or cliffhangers for the next book. I look forward to reading the rest of the trilogy and will post when I do.